OS X has included Time Machine since OS X 10.5 (Leopard). Here’s how to get set up in OS X 10.8 (Mountain Lion) using an external drive. For more tips on backing up your data, see "Backup basics" and "Bulletproof backups." To ensure that you have room for multiple versions of files, select an external drive that's at least two times bigger than your Mac’s hard drive. To determine how large your Mac’s hard drive is, select it in the Finder and press Command-I. If your drive capacity is 999GB, for example, you’ll be best off with a backup drive that’s 2TB or larger. The best type of backup drive to use depends on the type of Mac you have. If you have a Mac with Thunderbolt, select a drive that’s Thunderbolt-ready, to take advantage of its speed. The options for Macs without Thunderbolt are FireWire- and USB-compatible drives. Though USB 3.0 and FireWire provide equivalent performance, Apple’s latest MacBook Pro release lacks a FireWire port, which suggests that Apple may be phasing FireWire out of its designs. Consequently, a USB 3.0 drive may remain compatible with future Macs longer. Once you have an external drive, confirm that it’s properly formatted for the Mac. If in doubt, connect the hard drive to your Mac and open OS X’s Disk Utility (in the /Applications/Utilities folder). In the left-hand column of the Disk Utility window, select the disk that you want to designate as your Time Machine backup. At the bottom of the window, you’ll see information about it. If the disk’s Format reads 'Mac OS Extended (Journaled)', you’re good to go. Normally, as long as your new external hard drive is formatted correctly, all you have to do is plug it in to get started backing up with Time Machine. If you don’t see this dialog box automatically, or if you’ve just reformatted your drive, click the System Preferences icon in the Dock (or select Apple menu > System Preferences). Click Time Machine and then click Select Disk. Your external drive should appear in the list. Select the disk and click Use Disk. Time Machine will begin a full system backup. The Time Machine window gives you access to most of the program's options. Your first full system backup will take a few hours or more, depending on the size of your Mac’s hard drive. But subsequent regular backups will take only a fraction of that time because the drive will limit itself to updating what’s already there and saving new files. If your drive stays connected to your Mac, the scheduled hourly backups will take just seconds to complete. By default, you’ll now see a Time Machine icon in your menu bar; it looks like a clock encircled by an arrow running counterclockwise. Click this icon to get quick access to information about your last backup and to the Time Machine preferences panel. If you don’t like it, you can prevent this icon from appearing by going to the preferences panel and unchecking the Show Time Machine in menu bar option. Exclude items you don’t need: If you don’t need to save some items—restaurant takeout menus in your Downloads folder, for example, or miscellaneous screenshots that live on your Desktop—you can select items to omit from your system's regular backups. Go to the Time Machine preferences pane and click Options. Then click the plus-sign (+) button under the list labeled Exclude these items from backups. From there, pick and choose the items you’d like to leave out, and click Exclude when you're finished. In the large Exclude list, you’ll see the folders or individual files that you selected. You can change your mind about these at any time by selecting a file and clicking the minus-sign (-) button. To save space on your backup drive, exclude items you don't need to backup. Erase older backups without interruption: When your external drive gets full, Time Machine will automatically erase older backups to make room for new ones. The default setting is for the program to notify you when it has deleted an older backup, but if you don’t need this information, uncheck the box next to Notify after old backups are deleted in Time Machine's preferences. Backup on battery power: If you’re a MacBook user, you can also choose to back up while using battery power. Go to Time Machine's preferences, click Options, and select the Back up while on battery power option. By default, Time Machine will back up only when your laptop is connected to AC power, to ensure that your MacBook stays powered during the backup process. If the battery drains completely during a backup, the backup won’t be complete and may get corrupted. 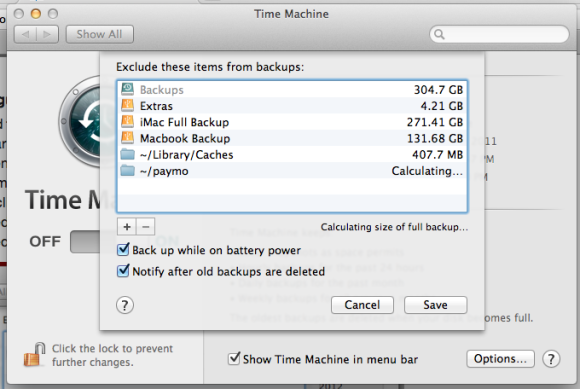 Regularly using Time Machine to back up your files is the final step. If you have a desktop Mac, leave your external drive plugged in—Time Machine will launch automatically and perform backups hourly. 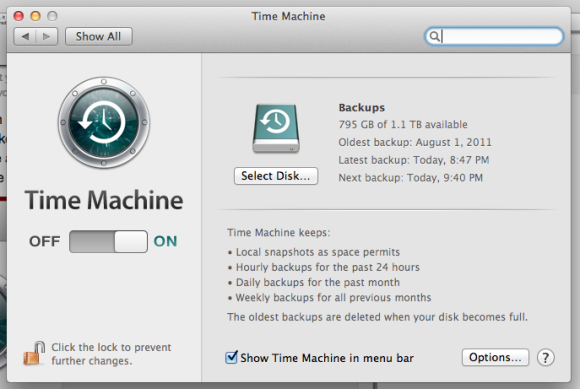 You can also manually start a backup by clicking the Time Machine icon in the menu bar and selecting Back Up Now. If you don’t keep your backup drive connected to your Mac—because your system is a laptop and you’re using on the go—remember to hook it up regularly to protect your data. The Time Machine icon will display an exclamation point when you haven't run a backup for a while. Just as it did when creating your first full system backup, Time Machine will start running as soon as your drive is plugged in. Editor’s note: This story was updated on 11/11/2012 for Mountain Lion compatibility.